The Achilles tendon is the strongest and largest tendon in the body. It is a tendinous structure (attaches muscle to bone) that forms from a combination of the gastrocnemius-soleus muscles located in the calf. The tendon attaches to the heel bone (calcaneus) and causes the foot to push off (plantar flex) when the calf muscles tighten. The tendon is necessary for normal walking, running, and jumping. Athletic and traumatic injuries to the Achilles tendon are common and can be disabling. 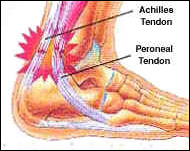 Achilles tendonitis is an inflammation (swelling) of the tendon, which usually occurs as a result of overuse injury. Basketball players are the most susceptible to Achilles tendonitis because of the frequent jumping. Any activity requiring a constant pushing off the foot, such as running or dancing, may result in swelling of the tendon. People with Achilles tendonitis may experience pain during and after exercising. Running and jumping activities become painful and difficult. Symptoms include stiffness and pain in the back of the ankle when pushing off the ball of the foot. For patients with chronic tendonitis (longer than six weeks), x-rays may reveal calcification (hardening of the tissue) in the tendon. Chronic tendonitis can result in a breakdown of the tendon, or tendinosis, which weakens the tendon and may cause a rupture. The recommended treatment for Achilles tendonitis consists of icing, gentle stretching, and modifying or limiting activity. Nonsteroidal anti-inflammatory medications (NSAIDs), such as ibuprofen or aspirin, can reduce pain and swelling. Physical therapy and the use of an orthotic can also be helpful. For chronic cases where tendinosis is evident and other methods of treatment have failed, surgery may be recommended to remove and repair the damaged tissue.